The villainous Kremlings have stolen Donkey Kong's banana hoard and escaped across DK Island. Donkey Kong and his buddy Diddy Kong set out across the island to track them down and defeat the Kremling leader, King K. Rool. Donkey Kong is a brute and can take out larger enemies in a single bound, while Diddy is weaker but more nimble. Tag team between them as you clear over 40 stages, finding hidden bonus rooms and riding your Animal Buddies. 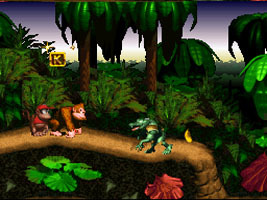 Donkey Kong Country was the first game to use pre-rendered CGI graphics and astounded fans and critics with its visuals upon its 1994 release. In 1993, British development studio Rare was experimenting with a CGI modelling technique called Advanced Computer Modelling (ACM) allowing detailed sprites to be created using 3D models. A Nintendo representative named Tony Harman visited Rare during this time and saw a demo boxing game that used ACM. He presented the technology to Nintendo Co. Ltd., who recognised Rare would need assistance in bringing the concept to a full game. Nintendo purchased 25% of Rare and provided several million dollars worth of Silicon Graphics workstations. Developing a game using ACM required a suitable license. Rare expressed an interest in producing a Donkey Kong game, as despite being one of the biggest game series of the early 1980's, it had been largely abandoned. 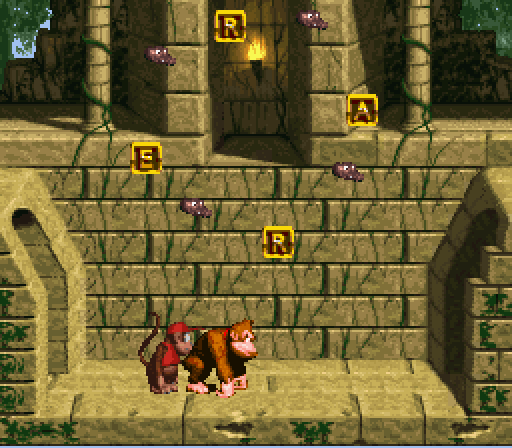 Rare was given free-reign to create a new world for the Donkey Kong character. Shigeru Miyamoto, creator of the Donkey Kong character, provided a redesign for the character, adding a necktie that would go on to become the character's trademark. The villains of the piece, the crocodilian Kremlings, were salvaged from an abandoned Rare project, while Diddy Kong was created after Shigeru Miyamoto protested at using Donkey Kong Jr.
By the game the game was completed, a total of 22 man years had been spent developing the game, more than any other game at the time. Nintendo launched Donkey Kong Country in November 1994, two weeks ahead of schedule, and it was the first Nintendo game to be launched in the UK before any other region. 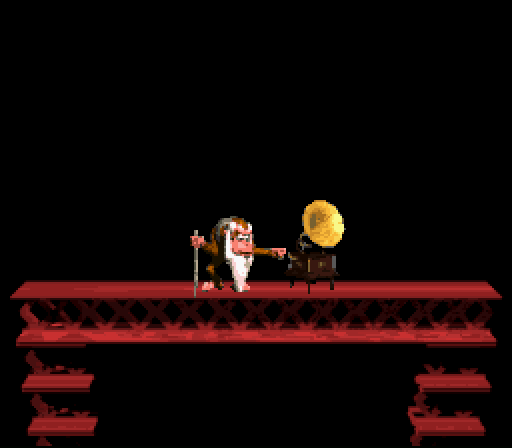 The game's opening begins with Cranky Kong standing on red girders and playing the 8-bit title screen music from the arcade Donkey Kong. 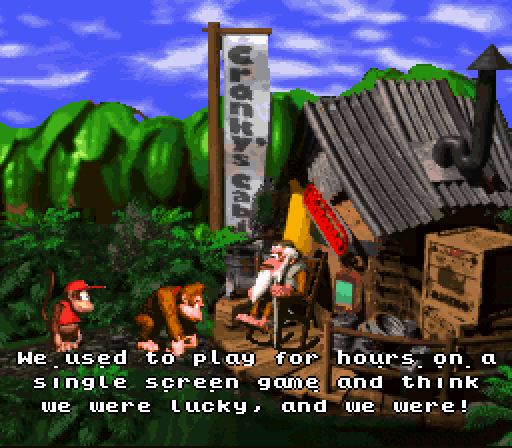 When you visit Cranky Kong, he will usually ramble on about how old games were better than modern games, berating the flashy, modern graphics. He makes occasional allusions to classic games, including the arcade Donkey Kong. In several of the Bonus rooms, you have to collect moving golden letters in the correct order to spell out a word. The words you have to spell include "Rare" and "Nintendo", the developers of the game. 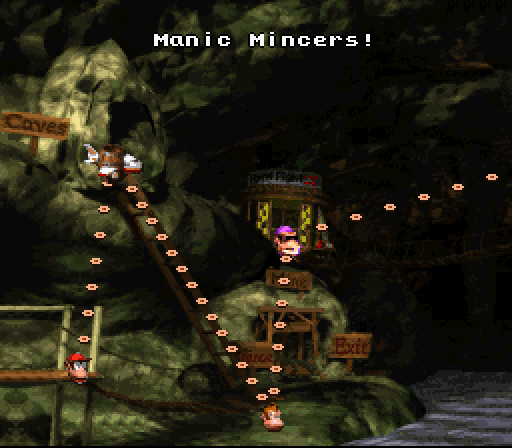 The name of the "Manic Mincers" stage appears to be a reference to the classic UK ZX Spectrum game "Manic Miner".